The ergonomics profession was recently granted a Royal Charter and there are many ways ergonomists can work in collaboration with OH professionals to enhance the safety and wellbeing of working people. Stephen Barraclough and Wendy Jones explain more about what ergonomists do. Safeguarding employees’ health has never been as challenging as it is now, taking into account the economic pressures many organisations and companies are under. Therefore, if specialist help is sought to solve a problem, it is vital to have confidence in the professionals involved. The granting of a Royal Charter to the Institute of Ergonomics & Human Factors gives recognition to the ergonomics discipline of its contribution to the safety and wellbeing of working people. The only place in the world where you can find a chartered ergonomist and human factors specialist is among the members of the Chartered Institute of Ergonomics & Human Factors (CIEHF). The C.ErgHF status indicates that competence has been thoroughly assessed by peer professionals to international standards, and that those individuals with this status have shown that they are committed to continuing their professional development. It is feasible to work with good professionals in many disciplines who are not chartered, but being chartered demonstrates a desire to take responsibility for, and pride in, professional achievement. Faced with a choice between similar candidates, one chartered and one not, which one would you choose? The introduction of the term “ergonomics” to the UK is commonly attributed to Hywel Murrell who described it in the mid20th century as “the scientific study of the relationships between man and his working environment” (Murrell, 1965). Since then, the discipline has extended its scope outside of the workplace to encompass “designing for people, wherever they interact with products, systems or processes”, and the term “human factors” is often used to reflect this wider perspective. 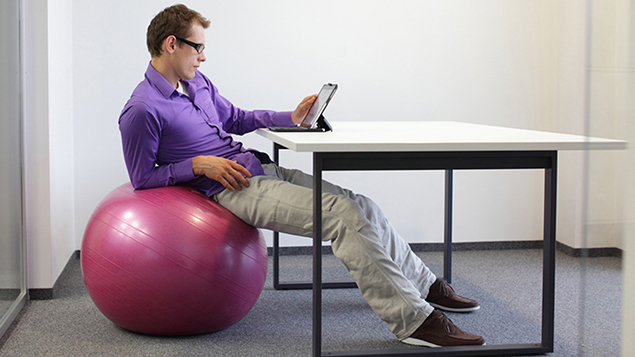 Thus, ergonomic principles are now applied in areas ranging from sports equipment and leisure activities to the usability of computer websites, and from the safety and effectiveness of air, rail and road transport to the design of office seating. For example, when the 2000 Ford Focus was being developed, ergonomists created a suit that enabled the designers to experience driving from the perspective of older users (Loughborough University, 2010). The car subsequently produced was applauded for its high usability of controls, ease of access and other features that improved the driving experience for all users. This article will focus on the more traditional application of ergonomics to the workplace, and the ways in which it dovetails with the work of OH practitioners. It will identify the areas of overlap between the disciplines, and how OH practitioners can benefit by either seeking specialist support from chartered ergonomists or by learning more about ergonomics themselves. The key knowledge areas required for ergonomists are detailed in the box below, and many of these areas are also important areas of expertise for OH nurses and physicians. 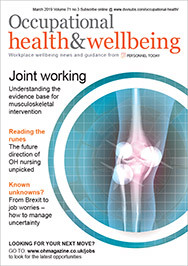 Supporting individuals with musculoskeletal disorders or disabilities, for example, will be a core activity for most OH advisers, and many will suggest workplace modifications to reduce the impact of these conditions. Some will also have expertise in work or workplace assessment – measuring noise or lighting levels, advising on shift patterns, assessing individuals with vibration-related conditions and making recommendations on continued exposure. The psychological make-up of individuals and how this affects their health and their ability to work is also a key area of occupational health practice – consider, for example, the importance of taking into account psychosocial factors (or yellow flags) when assessing an individual with back pain. Many practitioners may also advise on the influence of psychological factors at an organisational level, advising on stress risk assessment and contributing to policy development. The two final areas of ergonomics knowledge are systems and methods. A system is a set of things or parts that function together to fulfil a purpose. Systems can be small and simple or large, complex, and made up of smaller subsystems. Systems of interest in ergonomics will have a human component, with humans interacting either with equipment and machinery or with each other. Indeed, there is the concept of sociotechnical systems, which refers to the influences of social and technological factors on the functioning and goals of an organisation. Systems is not a specific area of OH expertise, although practitioners will undoubtedly recognise the impact of interactions within organisations – consider, for instance, the influence of a new manager on a team or department, or how your work effectiveness is affected by changes in computer software. Experimental methods are also unlikely to be a core part of the OH role, but some practitioners may use measurement techniques including assessments at an individual level (such as the Hospital Anxiety and Depression Scale or the Becks Inventory) or organisationally, perhaps using the Health and Safety Executive’s management standards tool to assess work-related stressors, or wellbeing measures such as the Short Form Survey of Patient Health (SF36). the impact of any personal factors such as ill health or disability. For those who wish to learn more, there are short courses available covering structured assessment tools, such as rapid upper limb and entire-body assessment to assess postural risks at work. Study days and conferences are organised regularly by the CIEHF and are open to non-ergonomists. For example, the recent CIEHF annual conference included several presentations on workplace stressors and their impact on health, as well as sessions on: the appropriateness of manual handling; shift work and fatigue; and ergonomic factors in healthcare. Ergonomics is an excellent choice for OH advisers who want to enhance their practice through study at a higher level. Several universities offer masters-level courses that can be studied part time or via distance learning and thus can be combined with employment. Occupational health practitioners might also encounter situations where they can work with a chartered ergonomist to address a particular problem. While larger organisations may employ in-house ergonomists as part of their health and safety function, there is scope in smaller companies to buy in expertise for specific projects. Ergonomists come from a wide range of backgrounds, and although all of them will have knowledge across the themes outlined in the box below, many will have areas of special expertise. Some will have qualifications in engineering or design; some have safety expertise; some come from a psychology background; and some have healthcare qualifications such as physiotherapy, occupational therapy or nursing. There is, therefore, a wide range of circumstances where ergonomics expertise may be brought in to help solve a problem. For example, complex manual handling tasks or the design of a production line may be assessed by an ergonomist who has particular knowledge of physical ergonomics, and/or who may also design and run training for employees involved in these tasks. The design of work processes or of control panels may be supported by an ergonomist with particular expertise in cognitive ergonomics, who will take account of factors that influence attention and decision making. Others may have a background in environmental physiology and can help to address the difficulties of working in hot, cold or otherwise challenging environments. There are also ergonomics consultancies and individuals that specialise in work within particular industries such as healthcare, defence or transport. The clinical background of OH practitioners is an excellent basis for ergonomics practice, and their experience of taking into account individual differences matches well with the ergonomics perspective of “fitting the task to the human” (Grandjean, 1997). Occupational health practitioners with a particular interest may consider joining the CIEHF as associate or technical members, and those who acquire a higher level of ergonomics expertise through education and practice can apply for chartered membership. Membership provides opportunities to learn from other ergonomists, as well as access to Ergonomics and Applied Ergonomics, two of the leading academic journals in the field, which publish the latest research in the discipline. Those who are self-employed or who work as consultants could particularly benefit from being able to demonstrate their expertise in the field of ergonomics and promote themselves through the institute’s website. The CIEHF website has details of training opportunities through short courses and at postgraduate level. It also hosts a register of consultancies to enable you to find details of suitably qualified ergonomics practitioners in your area to help address particular issues. Grandjean E, Kroemer KH (1997). “Fitting the task to the human: a textbook of occupational ergonomics”. CRC press. Murrell KH (1965). “Ergonomics: Man in his working environment”. London: Chapman and Hall, p.496. Loughborough University (2010). “A day in the life of”. The View: Spring/Summer. Anatomy and physiology, including: anthropometry (study of the measurements and proportions of the human body); physical capabilities; musculoskeletal disorders; ageing; and sensory and motor disabilities. Work environments, including: noise; thermal environments; visibility and lighting; vibration; circadian rhythms; physiological fatigue; G-forces; and hypobaric environments. Psychology, including: behaviour and attitudes; motivation; risk perception; psychological stress; safety cultures; team work and groups; decision making; cognitive skills; organisational behaviour; and organisational change. People and systems, including: human machine systems; knowledge elicitation; and systems theory. Methods and tools, including: experimental design; statistics; and measurement techniques. Stephen Barraclough is chief executive of the Institute of Ergonomics & Human Factors and Wendy Jones is a health researcher in construction at Loughborough University and a chartered ergonomist and SCPHN (OH).